South Africa 2010 round up so far and what’s still to come..
With just the final round of group games remaining there are only 90 minutes of World Cup 2010 left for half the teams. Lets take a look forward to the remaining games and reflect back on what’s happened thus far. In Group A it would appear that both Uruguay and Mexico have all but secured their spot in the final 16 and a draw between the two of them tonight would see them both go through. However a draw for Mexico would see them finish 2nd in the group meaning a show down against Argentina in the next round – obviously not ideal, so it makes for an interesting final game and gives a glimmer of hope to both the rainbow nation and a largely underwhelming French side. For South Africa, it appears they will be the first host nation to fail to emerge from the group stages and for the French it would be a travesty if they actually scrape through. They have been beyond disappointing thus far and clearly their much publicised internal problems are effecting the performances on the pitch – there must be plenty of Irish fans around the world who cant help but smile – fair play I say! The Webmaster suggests Mexico will have the goods tonight in a narrow win which will see them top group. 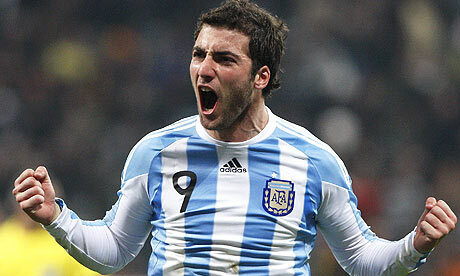 Hopefully the narrow defeat will still leave Uruguay in 2nd spot leaving them the unfortunate task of facing Argentina. South Africa and France to draw sending the French team to their holiday destinations, where they clearly want to be, and leaving the South Africans to join the rest of the country in the stands; blasting on Vuvuzelas. Moving on to Group B Argentina are sitting pretty at the top of the group and as long as they avoid defeat tomorrow they will go through in first place. Two pretty solid performances so far see them on 6 points and gives them an opportunity to give some of the remainder of the squad a run out tonight. The Greeks face the tough task of needing at least a point from the game against Maradona’s men to stay alive. When you combine their inability to score with the class of the Argentinian outfit their chances look slim. It is also likely that South Korea will handle any fight from Nigeria and go on to win their final game. The webmaster predicts Argentina will make light work of the Greek side, recording another win and topping the group on 9 pts leaving them to meet Uruguay in the next round. Whilst Korea’s victory will see them finish in second place and through to the final 16 to face off against Mexico. Capello brings squad together - time to perform! Group C appeared to be the easiest group of the lot and the fact the likes of England and the USA have struggled highlights the disappointing nature of the tournament so far. Admittedly USA were robbed of a victory against Slovenia, with an outrageous ruling out of a late winner – the ref had almost blown the whistle before the free-kick was taken. Unfortunately unlike the webmasters’ predictions, England have reinforced their status of chokers with two disappointing performances against USA and Algeria. Despite the poor performance so far, a victory against Slovenia will see them sneak through, so all hope is not lost. There also appears to be a rift in the English camp, a claim that the players have denied, but there is no doubt the pressure has mounted on Capello and his men and they certainly need to turn it around against Slovenia. The webmaster suggests that both England and USA will pull of a victory in their final game leaving USA in 1st place ahead of England on goal difference – meaning England will face the tough task of Germany in the next round. Have we seen Harry for the last time? Mathematically anyone in Group D can still make it through, making for a very interesting last round in the group. Germany started off so well with a convincing victory over Australia but were then shocked in the second game by a determined Serbian side who managed to pull off a very unlikely victory, especially after a poor performance against Ghana. Australia have been on the receiving end of two arguably harsh red cards that has put a massive dent in their world cup campaign. After a disappointing effort in the first game they came out against Ghana with a bang. Everything started so positively and grabbing an early goal put us right back in the mix, but Kewell’s red card and the resulting penalty really put us under the pump. In all fairness Australia still deserved to win the game and really did a fantastic job with only 10 men for such a long period – if only Wilkshire actually tried to score instead of passing to the keeper, things could have been very different. Personally the webmaster felt Ghana were very disappointing – surely they had to try and go for the win against a 10 man Aussie team especially knowing a win would have secured their spot. They now face the task of coming up against Germany in the last game. Based on the performance against Australia, the webmaster sees Germany recapturing the form they showed in the first game and brushing aside Ghana with ease. This will leave qualification open for Australia to pip both Ghana and Serbia at the line. The webmaster cannot decide between a draw or Australian win, but either way it will then come down to goal difference for the team in 2nd and 3rd. Moving on to Group E: we see the Netherlands who are one of only two teams that have already booked their spot in the final 16 – along with Brazil. The dutch have had two solid performances but have definitely not hit full tilt just yet and will be banking on the return of Arjen Robben to spark some more life into the side come the knock-out stages, if not against Cameroon. Japan and Denmark face off in their last group game which could prove to be an exciting one with the winner going through. A draw would send Japan through most likely in second spot as long as Holland can secure at least a point against a Cameroon side that hasn’t really turned up. Cameroon are already knocked out of the tournament after two lacklustre performances against Denmark and Japan and are just playing for pride against the Netherlands in the last game. In the view of the webmaster Netherlands will progress in first place after another victory over Samuel Eto’s Cameroon, setting up a likely round of 16 battle with defending world champions Italy. Japan should be able to at least draw their game against Denmark which will see them against Paraguay in the next round. Something tells me we wont see this again - thank god! In Group F we have seen Paraguay almost sew up their spot in the final 16 with impressive performances against Italy and Slovakia. In their final game they are coming up against a resilient New Zealand team who are determined not to lose, however as long as they avoid defeat they will go through in first place. 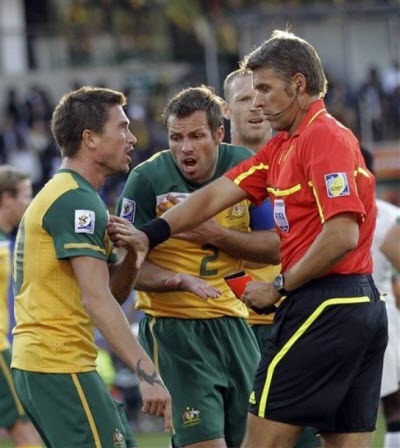 Captain Ryan Nelsen has proved a colossal force at the back for the All Whites making them very tough to break down. Incredibly, if New Zealand could pull off another draw as well as Italy drawing with Slovakia with the exact same result the decision of who goes through will come down to a drawing of lots!!! This is because New Zealand and Italy will be tied on points, goal difference, goals for, goals against and the result between them was a draw – ridiculous but here’s hoping! Alternatively if New Zealand win they will go through anyway. The current world champions, Italy, have been a massive let down so far in a world cup which has highlighted below par performances from some big teams. They have been highly unconvincing but will still get through with a victory over Slovakia in their final game. For Slovakia their is a glimmer of hope, should they beat Italy they will progress alongside Paraguay. Whilst the webmaster would love to see 0-0 draws in both games so we can draw lots to see which of New Zeland and Italy will go through (you know you want to see that! ), it appears unlikely and if it happens both games would be rather boring. Rather the webmaster suggests Paraguay will beat New Zealand and Italy will beat Slovakia sending Paraguay to meet Japan in the next round and Italy to face off against Holland. Moving on to Group G, where we have Brazil who have already qualified for the round of 16 but could lose out on first place if they lose to Portugal in the final game. Brazil overcame a very determined North Korean outfit in their first game before a more convincing display against Ivory Coast in the second game. They will however be without Kaka in the game against Portugal after a sending off on the back of a ludicrous second yellow late in the game against Ivory Coast. Whilst Kaka has been largely disappointing thus far, his presence will still be missed. Portugal on the other hand started quite poorly against Ivory Coast, where they barely posed an attacking threat, but lifted to another level last night as they humbled North Korea in an embarrassing 7-0 victory. They were simply electric once they got going last night in a performance that has seen them almost guarantee a spot in the next round. Even if they lose to Brazil in the final round it would take a huge win for Ivory Coast over North Korea to swing the goal difference back in their favour. Ivory Coast had started so well against Portugal and in the view of the webmaster were unlucky to not come away with 3 pts from the game. A disappointing result against Brazil coupled with Portugal’s massive win last night has virtually put an end to The Elephants’ campaign. North Korea are already knocked out of the world cup and will be determined to show their worth against Ivory Coast in their final game. The webmaster feels the Portugal/Brazil game could be too close to call and could possibly end in a draw which would suit Portugal as I’m not convinced either will want to win, with the reward for coming first, a showdown with pre-trounament favourites, Spain, in the next round. Ivory Coast should have the goods and defeat North Korea but will still bow out due to goal difference. Finally, Group H is left in quite an interesting position. Chile currently sit top of the group with 6 pts, but are still a chance to miss out on the knockouts. They come up against Spain in the final game where a single point would confirm top spot for the Chileans. For Spain it is virtually a must win game as if they fail to win and Switzerland can secure victory over Honduras, the pre-tournament favourites will be on their way home. In what has been the upset of the tournament, Spain managed to lose their first game against Switzerland. They dominated possession but just could not manage to put the ball in the net. A comfortable 2-0 victory last night over Honduras has put them back on track, but Chile pose much more of a threat and Spain will need to step it up quite significantly to secure 3 pts. For Switzerland last nights result was a disappointing one however a victory over Honduras by 2 goals or more should send them through irrespective of the result in the other game. Mathematically Honduras could still go through in 2nd spot should Chile beat Spain and Honduras pull off a big victory over Switzerland, although it appears unlikely. The webmaster suggests that Spain will overcome Chile in the final game and that Switzerland should also beat Honduras in their final game which will leave Spain, Chile and Switzerland all tied on 6 pts. This will then come down to goal difference to work out who finishes 1st and 2nd. If both Switzerland and Spain win by 1 goal that would see Spain top the group on a better goal difference with Chile and Switzerland tied on goal difference, goals for and goals against and Chile would go through due to their result between each other (1-0 to Chile last night). Leaving Spain to face Portugal and Chile to face Brazil in the next round – PS I might have got this wrong.. feel free to let me know if I have! no more diving – I’m so sick of seeing these prima donna’s diving around for absolute rubbish, its plain embarrassing and brings a lack of class to the game we love so much – the webmaster would love to see a straight red card be given for diving, if we impose that for a few matches diving will never be seen again! no more complaining about the damn ball – it’s a ball, it’s round –> KICK IT! preferably into the goals.. if you’re a keeper –> CATCH IT OR STOP IT! quite simple. Following the group A profile on France passthesugar has done a little bit of research into one of their more anonymous, yet outstanding, prospects – Yoann Gourcuff. Gourcuff is in a cluster of footballers who haven’t quite reached the lofty heights of a Messi or Ronaldo, but have seen their stocks rise considerably to the point where a breakout World Cup could see them become household names. After all, nothing like the World Cup can start the rumours of 7, or even 8, figure transfer rumours and if you can never be considered an all time great without World Cup success on your resume. The much maligned Gourcuff left Milan and a frustrating spell where he never fully lived up to they hyped expectations for Bordeaux on loan in 2008. At Milan, the Frenchman had been hampered with injuries and consistently left out by none other than Carlo Ancelloti who preferred Kaka. At Bordeaux Gourcuff had an immediate impact, helping the side to the double in France and become a European force. Their defeat to Lyon in their impressive Champions League was a bitter disappointment and may be attributed to a long and continuous spell of football for Bordeaux which has left Laurent Blanc’s squad’s lack of depth on show. The Les Girondins have been one of the form sides for the majority of the past two years, and it is only recently that they have let their ascendancy slip to the advancing Lyon. Gourcuff had much to do with their rise to prominence. He is a proper, old-fashioned playmaker, who sends purists into a flurry every time he is on the ball. There’s little pizazz or showy tricks in his repertoire (think Ronaldo and Messi), but Gourcuff consistently shows that creative football does not automatically mean flair. However, recently, Gourcuff has been poor, particularly in their Champions League exit. In this piece, we’ll show that its more due to the the demise of the classic number 10. In 2009 Gourcuff was employed by Blanc in an advanced, central role that gave him freedom to sit in behind the frontmen and push forward regularly. Many observers hoped that his role might prefigure a renaissance in the kind of traditional playmaker whose decline in recent years has ben a keen source of regret to purists who salivate for patience and wit. Recently, however, the sparkle seems to have worn off. Their definite slump may be attributable to their stubborn formation. It’s been mentioned previously by passthesugar that football has evolved dramatically over the past two seasons, with the now antiquated 4-1-3-2 and 4-2-3-1 being swamped by the new wave of modern set ups. Their main nemeses, Marseille and Lyon both opt for a 4-3-3. Against the traditional 4-4-2 Bordeaux’s setup can give their playmaker in Gourcuff time on the ball and space between the defence and midfield to exploit. But these two teams in particular have learnt to crowd this area and stifle the dangerous Gourcuff with a specified holding player. Bordeaux’s flexibility was demonstrated afresh intheir 2-1 victory over Olympiacos earlier this month in the second leg of the Champions League last 16. The team set out in the custom European 4-2-3-1, with Wendel pushing forward from left-midfield at Bordeaux goal-kicks to give Chamakh a target for his trademark flick-ons. (shown above) Plašil would subsequently drop back into midfield alongside Diarra and Fernando, creating what was effectively a 4-3-1-2. 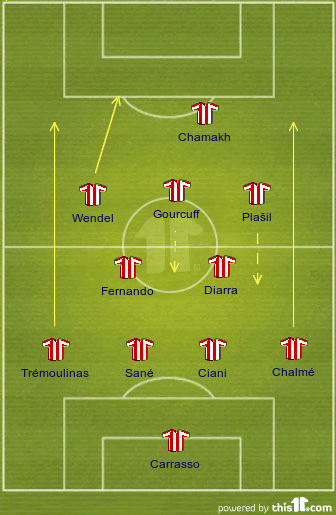 Wendel and Plašil’s ability to drop deep allowed both Fernando and Diarra to press their opponents high up the pitch, with Diarra on one occasion in the first half chasing his man all the way back to the edge of the Olympiacos penalty area. When Diarra was sent off after picking up two yellow cards Gourcuff dropped back into a defensive midfield position, but Bordeaux were still able to close out the win. The limits of the side’s versatility were finally exposed in their 3-1 Champions League quarter-final first leg defeat to Lyon when, with Ludovic Sané deputising for the injured Planus and Plašil occupying a midfield holding role in place of the suspended Diarra, Bordeaux were undone by an uncharacteristically nervous defensive performance that saw them concede two sloppy goals in the first half. Blanc’s impressive set up as made him the firm favourite to succeed the clown Domenech as the French national coach in the summer. Chamakh looks likely to head to Arsenal and interest in Gourcuff will only rise following the World Cup. Confronted by physically imposing and well-drilled opponents who effectively shut off space in their own defensive third, Gourcuff was made to play further and further from the Lyon penalty area and, despite Bordeaux’s desperate need for goals, spent much of his time trying to coax his team-mates into life from inside his own half. Originally held up as the heir apparent to Zinedine Zidane as France’s playmaker-in-chief, doubts are beginning to creep in about Gourcuff’s suitability as a true number 10. L’Equipe’s football writers last week published their France XI for the World Cup (below) and it featured Gourcuff alongside Lassana Diarra in a midfield holding role, with Franck Ribéry granted attacking freedom in central areas behind Thierry Henry. A panel of experts on French TV show Téléfoot reached a similar conclusion about where Gourcuff should play, while his own father, Lorient coach Christian, feels his son would be better suited to the role of a deep-lying midfielder organiser akin to Milan’s Andrea Pirlo or Real Madrid’s Xabi Alonso. To date Gourcuff has failed to convince in a playmaking role for France. He is not helped by Raymond Domenech’s persistent use of strikers rather than midfielders in the wide areas of his 4-2-3-1, who shirk their role in the creative process because they are unaccustomed to playing in midfield, but existing trends have already highlighted the need for central creative players to adapt to the quicker pace of the game by changing their position or changing the way they play. Lacking the pace to re-locate to the flanks, Gourcuff’s only option appears to be to ‘do a Pirlo’ and retreat into the kind of deeper role in which he operated during his formative years at Rennes and where he has already played on occasion for his current club. At 23 he and his coaches have a decision to make. “It’s the best position for Gourcuff in the future,” said Domenech at the end of last year when asked if Gourcuff could play in a deep midfield position for Les Bleus. “I enjoyed playing further back,” admitted the player himself, meanwhile, after slotting in alongside Alou Diarra in Bordeaux’s 1-0 home win over Paris Saint-Germain in December. Should Blanc leave Bordeaux, Gourcuff is bound to follow suit. His likely destination remains unknown but his future position on the pitch may require even more thoughtful deliberation. Quotes like this one: “That goal was no accident.” “It showed there was something magical about him. I felt ill when Zidane retired. Watching Gourcuff has cured me. When I see players like him, I feel like a small boy again.” from Cristophe Dugarry will mean that the pressure is well and truly on the young lad to perform in South Africa and lead their strong set up to glory. Viva le France – the French are always contenders even if they resemble a bit more of a circus this time round. • World Cup pedigree: 12 World Cups, 1 title (’98, when they hosted), second place (’06) and third place (’58, ’86). The French seem to have a never ending production line of talent and this time round it’s no different. They’ll be in the mix once again and face immense pressure from the French public to perform consistently. Les Blues have a youthful and attack minded squad – full of players smattered across the biggest clubs in Europe. They have a clown of a manager, Raymond Domenech, who is stifling conservative and old fashioned, not to mention his stubborn persona. Rest assure, when the French lose to South Africa 7-0, we’ll have to watch Domenech put on another one of those disbelief-type performances for the press. The French will have lofty ambitions and will expect nothing less than final 4 football. Ribery is one of the hottest properties in world football and the majority of the French attack will flow through his feet. Ribery started the trend of inside out wingers, who offer a direct goal threat more than a passing/crossing one. He has been prolific for Bayern and will replace the figure of Zizuo who was so pivotal in their previous outings. Recently, however, Ribery’s shady character has come to the fore and his underage prostitution case in France, which is only one of about a billion controversies swirling around the French camp, could affect him in South Africa. If the French go far, he could be a roughie for player of the tournament. Thierry Henry (forward, Barcelona) and the French national side conjure up all those images of his infamous hand ball that led to emergency political meetings between the respective nations. He’ll be an important cog, whether he features predominantly or not, as he adds some much needed experience to the youthful pot. Karim Benzema (forward, Real Madrid) has been linked to every club in the world in a typically media driven chase for his wares. He’s in and out of the starting side at Madrid and has not been a regular in Domenech’s setup to say the least. If he makes the pitch then he is a dangerous quantity who shouldn’t leave the Froggies short for goals. William Gallas (defender, Arsenal) hasn’t had the most spectacular season for the Gunners, but is one of those tough and experienced defenders that every side needs. He’ll be right at the heart of their defence which is certainly not the side’s strong suit. Yoann Gourcuff (attacking midfielder, Bordeaux) has remained an unknown quantity purely because of the relatively low coverage and interest in the French league. Rest assured he is a rare talent. More than Ribery, he is a direct replacement for Zidane and plays the creative role for the side. Gourcuff was the irresistible driving force behind Bordeaux’s rise to the crest of French football. Many pundits looked at the Frenchman to bring back the traditional number 10 to world football, however, recently the experts have regarded him as a holding midfielder who’ll line up next to the solid if not spectacular Diarra. Yoann is one of those players with big expectations and is primed to break through to the elite group at the top of world football. Watch for him to become a household name in June. Despite their prolific attacking side, Domenech refuses to get rid of his beloved two holding midfielders and favours leaving just the one striker on the paddock. This is the most obvious example of the manager relying on his tactics in Germany and a failure to evolve with the world game. Almost every side in Germany played the 4-2-3-1 and the French will line up like this once again – sigh. Domench is the nerdy guy and the French team are the really hot blonde. No one thinks it should work (and, more often than not, it doesn’t) but somehow they are holding the relationship together. The French dispatch all those pre-cup doubts with three emphatic wins in the group and proceed to the final four where Ribery scores a trademark thunderbolt from well outside the box to send them to the final. Screw that – the real fairytale here could come for Ireland. It’s the 22nd of June and it’s late on in the final group match. The French are being held by a stubborn home side who are still harbouring hopes of a remarkable qualification. The Mexicans are sitting pretty on top of the group and with their two wins and one loss, so the French are staring down the barrel of a first round exit. Gourcuff passes to Ribery who switches to the forward run of Malouda. The Chelsea star whips in a fizzing ball towards the substitute Henry who rises above the Afrikaaners and punches the ball into the top left net. The referee (and karma) blow the whistle ruling the goal out and giving Thierry a straight red. South Africa hold on and the French are sent packing. Despite the circus that the side has become, the French still possess one of the most potent attacking forces in the comp and are really only the laughing stock of the top 6 sides, rather than the laughing stock of the tournament. In Germany, similar doubts were harboured and they proved everyone wrong. Ribery, undeniably, is capable of that wonder goal that could send them into the second week of July. However, being the combustible commodity that they have become, a similar scenario to 2002 (where Senegal became everyone’s second favourite side) could ensue, despite their easy group. If they don’t win the group, then a mouth-watering match up with Argentina will result. Outstanding attacking weapons + Strong reputation and history – Domenech – Domenech – not a title winning defence – Domenech = top of the group and a quarter final farewell, as the Poms finally win a penalty shootout.